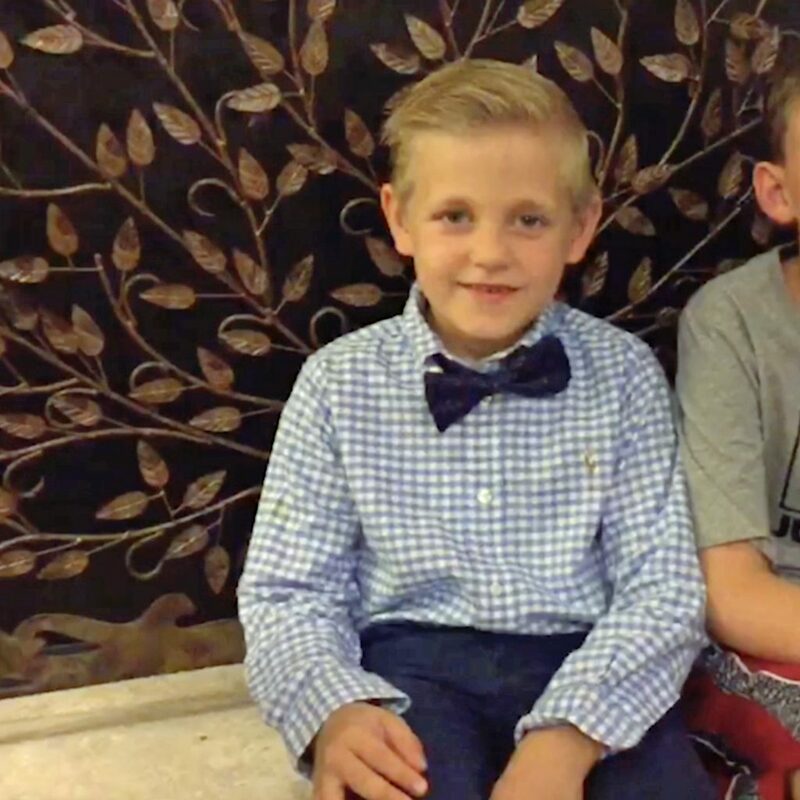 This adorable little boy takes a starring role in helping his family friends tie the knot, just as the unsuspecting bride did for his parents a decade ago. 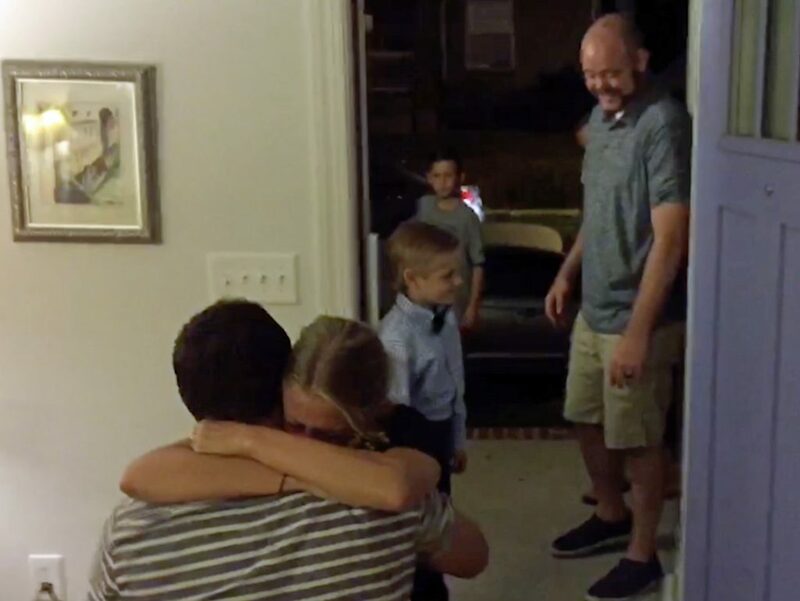 While visiting her parents in Durham, North Carolina, USA, Caroline McSwain arrives to a very special knock at the door from her next-door neighbour, 7-year-old Elijah McDonald. Clutching a bouquet of handpicked flowers and adorably dressed in a smart shirt and bow-tie, Elijah throws off his ‘big sis’ Caroline by asking to be her ‘ring berry’. Confused by the proposition, Caroline, who has been incredibly close with Elijah since he was born, pulls the preschooler in close, proclaiming ‘of course’ while laughing perplexed. However, quickly the meaning of Elijah’s request – to be her ring bearer – becomes apparent, as Caroline turns around to see her long-term boyfriend, Alex Ryskiwich, down on one knee, causing the 27-year-old to erupt into a flurry of tears. Overwhelmed Caroline, who now lives in Atlanta, Georgia, said: “Elijah is such a huge part of the family, I wasn’t surprised to hear the doorbell ring and see him standing there – he’s always in and out of my mum and dad’s house. 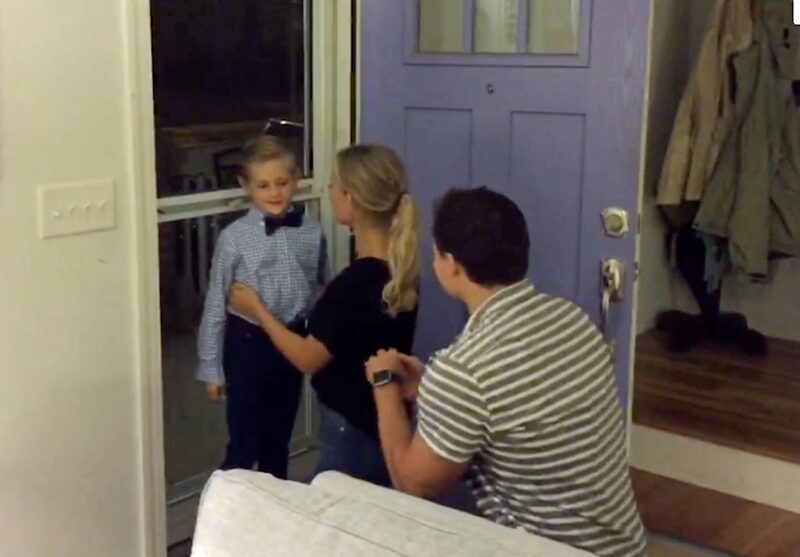 “When I saw him in his little handsome outfit, I just assumed he was coming back from a fancy dinner. “Even when he handed me the flowers, I didn’t think anything was out of the ordinary, he’s always doing sweet little things for me. “I was absolutely stunned when I turned around to see Alex on one knee, I’ve never been so surprised in my life. “We’re going away on holiday in a few weeks to a remote beach, and I was sure Alex was going to propose then. Caroline and Elijah’s family crossed paths over 20 years ago, when her Dad worked as a youth minister at Elijah’s dad, Tony’s, high school. Since then, the two families have been inspirable and now live next door to one another, making Caroline a very important part of Elijah’s life. Caroline said: “10 years ago when Tony proposed to E’s mum, Miranda, I was involved with the proposal and helped Tony set up the big question. “It just goes to show how life comes full circle, it’s amazing to think that both of our families have had an involvement in each of our proposals. “Needless to say, Elijah will be our ring bearer when we get married in May 2018. “We’ve been so overwhelmed by the love we’ve received from the proposal, many of my friends have asked to be E’s date.